The multiplier event ME16 in Germany, the SETTLE Lab fair, took place on 14th September 2017. 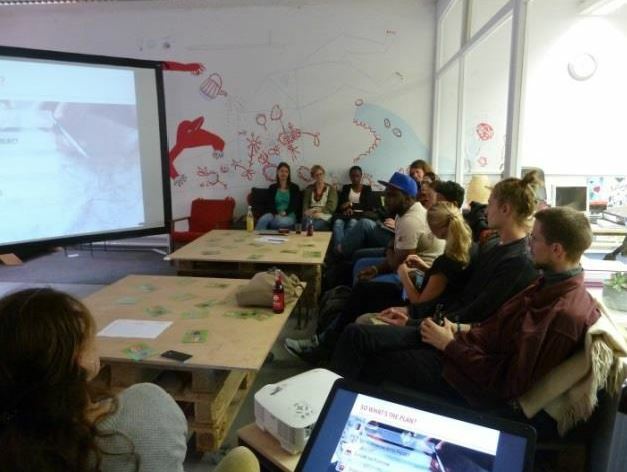 The fair took place in an alternative co-working space in Kiel, Germany. The co-working space is situated in a cultural building complex, Kiel’s former arts school. There, many social and environmental projects and companies work together and inspire each other. 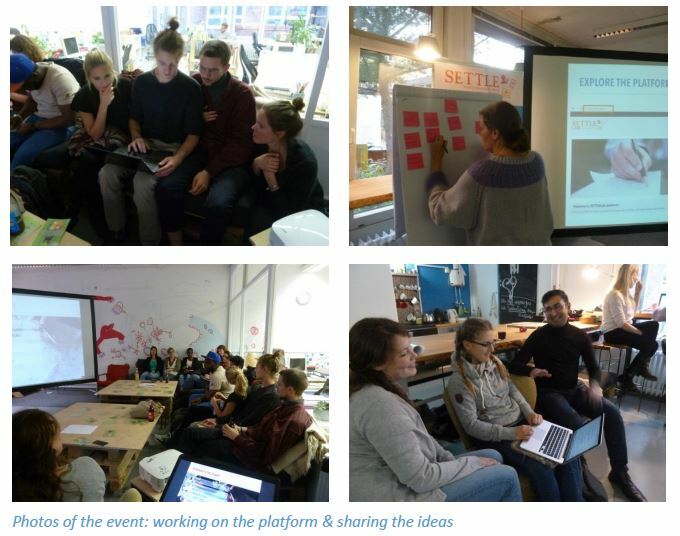 We, therefore, chose the venue: to attract potential final users and share the SETTLE lab among the existing community. The 20 participants of the fair had very different backgrounds, ages, interests and knowledge (also concerning social entrepreneurship). The aim of the event was to make potential final users experience the platform, to share their experience with the crowd and to stimulate each other. For that purpose, DomhanVision chose practical activities: we gave the participants possibilities to interact and to discuss contents and the structure of the open platform as well as to discuss possible uses of it. The participants only received firstly background on the SETTLE project and working process but the focus was put on the independent discovery of the platform. The SETTLE Lab fair was a success for the organisers and participants. Everyone enjoyed connecting with other participants and the openly designed agenda. They, furthermore, highly appreciated the output of the platform itself and gave helpful comments on the platform. The SETTLE Lab fair consisted of an informal get-to-know round among the participants. Everyone shared openly his or her experiences concerning social entrepreneurship in the plenum to enable free communication and connections from the beginning. DomhanVision, then, continued with a presentation about the SETTLE project and the SETTLE lab. We gave the participants an insight into the structure, activities of the project, its milestones and consortium. 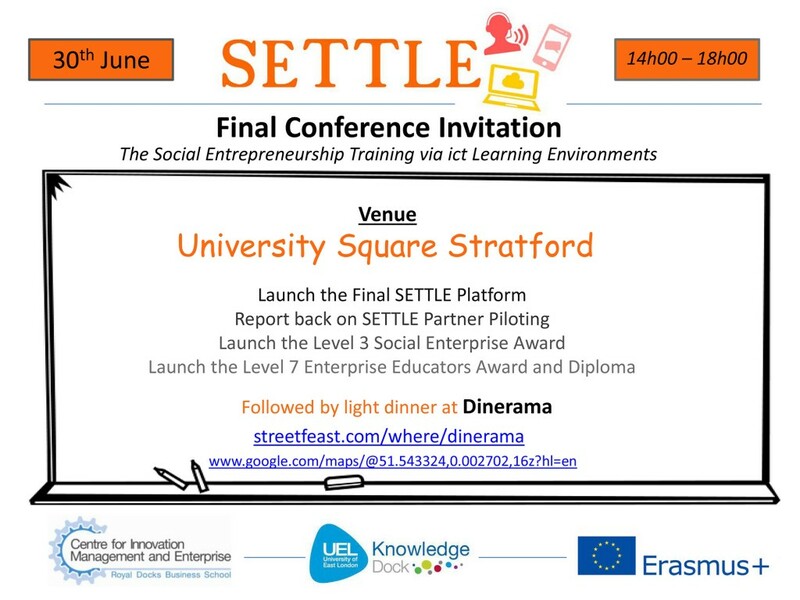 Later, the participants grouped to work in teams of 5 and chose one of the themes of the SETTLE Lab: ‘Introduction to Entrepreneurship and Social Enterprise’, ‘Business Planning and Management’, ‘Funding and Finance Management’, ‘Social Impact and Change’ or ‘Growth and Sustainability’ – concerning their interests and backgrounds. They had one hour to discover the theoretical and practical parts of the lab: the slides, the case studies and quizzes. After that, they discussed in the plenum about their thoughts on the lab and what ideas they developed in the groups. Later on, food and drinks were served and the participants enjoyed free conversations in a laid-back atmosphere. The SETTLE Lab fair offered much open space to the participants to experience the platform by themselves and to discuss over the contents and structure. In four different groups, the participants registered in their team on the platform. Therefore, everyone brought its laptop. They took some minutes to get an overview of the platform and to understand the different elements. Some of the groups already had background in social entrepreneurship. Therefore, they decided on a specific practical project they are involved in and used a theme to clarify certain topics. Other groups had no experience. Therefore, they registered for one of the first two themes: ‘social entrepreneurship’ or ‘Business Management’ to get an introduction into the topics. Because of this, the individual groups discovered the platform very differently. While some concentrated on the development of their own project, others were inspired by the case studies that were presented on the platform. Later on, all groups shared their impressions and ideas on how to make the platform more effective and entertaining. Many showed interest in using the platform in the future to fill it with own ideas, knowledge and questions. The offered level 3 modules were considered to be very useful to students and professionals who are relatively new to social entrepreneurship or do not have any or little business administration experiences. For further in-depth study of social entrepreneurship, modules with more detailed and depicted contents would be necessary. This would mean that the differences between for-profit and social entrepreneurship should be further elaborated on and examples and case studies need to be more precise in what the important success factors of sustainable social enterprises are.